Convicted 12.01.1877of allowing consumption out of hours. Fine £1 plus 17/6d costs or 1 months detention. Convicted 30.03.1881of allowing consumption out of hours. Fine 5/- plus 17/6d costs. Lintel above main door carved `Princes In ' - possibly retrieved from the inn by that name mentioned in Tombland in 1391. A TABLE BEER BREWERY with Copper, Coolers, &c. ready fixed, to brew six or seven coombs of malt at a time was for sale May 1808. Particulars available from the Ship, King Street. An application was made Saturday 22nd August 1891, by James Catchpole, for a music and singing licence. Granted. Purchased by Norwich City Council in 1970 and converted into 2 dwellings. 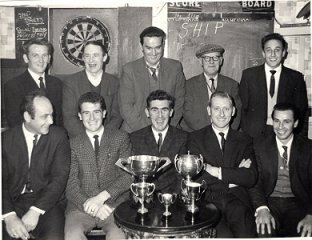 The last darts team - 1960. Thanks to the late Jack Winter for the photograph. 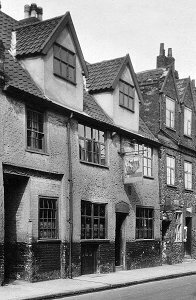 See page 93 of `Norwich In Old Postcards - Vol 2 ' - published 1989.